Recently appointed General Director for Tri-Cities Opera, Susan Shiplett Ashbaker brings with her over 30 years of experience in the performing arts. She is active in the opera and vocal world as an artistic advisor/consultant, master class presenter, lecturer, and an opera/vocal coach. 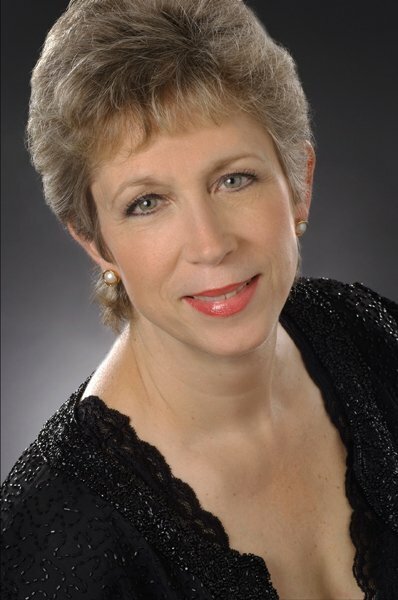 Her experience on both sides of the opera industry gives her a rare and comprehensive approach to the key elements of career advancement for singers as well as a unique vantage point in the administration of opera companies, arts organizations and institutions of higher learning. In the short amount of time that Ms. Ashbaker has been at the helm of Tri-Cities Opera she has been successful with increased funding from individual donors as well as foundations, securing over $260,000 in new foundation funding. She added two chamber productions (with piano accompaniment) for the 2014/2015 season at the Tri-Cities Opera Center: Poulenc’s La voix humaine (in English) and Michael Ching’s recently written opera, Speed Dating Tonight! The 2015/2016 season has been restructured for more variety. Two productions at the Forum Theater (Barber of Seville and Sweeney Todd) will bookend 2 recitals and 2 chamber operas, Tchaikovsky’s Iolanta, and a double bill with orchestra of The Telephone & Trouble in Tahiti. The 2015/2016 includes 3 Tri-Cities Opera premieres. A new logo and website design were unveiled this spring to much excitement. A “Twitter Zone” and “Family Zone” were added at the end of this season to allow thumb happy patrons to tweet selfies and hashtag their experience from their silenced and flash free mobile devices and children to use silent electronic devices when their attention span wanes. Ms. Ashbaker was affiliated with the Opera Company of Philadelphia for 16 years, the last 11 as Director of Artistic and Music Administration, leading the casting practices and reestablishing the Company as a pioneer in identifying and offering opportunities to young singers before they achieved national or international recognition, giving new and unique opportunities to well established artists, as well as supervising all activities of the Artistic and Music Departments. Under her leadership, OCP established an intern program with The Curtis Institute of Music. In addition, she has worked as assistant conductor and vocal coach with the New York City Opera, European Center for Opera and Vocal Arts (Belgium), International Vocal Arts Institute in Tel Aviv and Montreal, Theater am Goetheplatz (Bremen, Germany), the Academy of Vocal Arts, and was on the faculty of The Curtis Institute of Music from 1993-2010. Ms. Ashbaker has been Artistic Advisor for The CoOPERAtive Program at Westminster Choir College, a program designed to help young singers prepare for acceptance into an advanced young artist or summer apprentice program, since it’s inception in 2005. In addition to that role, she is one of the Master Vocal Coaches and Master Class presenters for the program. In January 2015, Ms. Ashbaker was the Music Director for the CoOPERAtive production of L’elisir d’amore. This past season alone, CoOPERAtive singers have been accepted to or hired by Houston Grand Opera, the Merola Program, Washington National Opera, Santa Fe, and Glimmerglass Opera, among many others. Ms. Ashbaker is an Adjunct Professor at Westminster Choir College of Rider University. A frequent judge for the Metropolitan Opera National Council Auditions (district, regional, and semi-final levels) and annual participant on the MET Quiz Show, Ms. Ashbaker has also participated as panelist with Opera America (where she was founding chair of the Artistic Network). 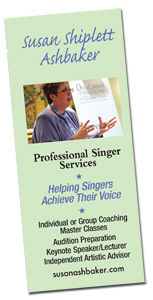 In 2002 and 2007, Ms. Ashbaker was the Honored Master Class Teacher of The Voice Foundation’s Annual Symposium. Ms. Ashbaker currently sits on the Board of Directors of the Musical Fund Society of Philadelphia. Ms. Ashbaker became Commonwealth Youthchoirs’ first Executive Director in 2007, with artistic and executive oversight of two youth choirs (Pennsylvania Girlchoir and Keystone State Boychoir). Under her leadership, Commonwealth Youthchoirs saw a 40% growth in budget, the creation of FYI! (Find Your Instrument! ), a choral music education program at Wister Elementary School, and a choral commissioning program that offered seven world premieres. Building partnerships within the Philadelphia community was a hallmark of Ms. Ashbaker’s leadership role with Commonwealth Youthchoirs. Key achievements include becoming the “Official Youthchoirs” of Opera Philadelphia, partnerships and collaborations with The Philadelphia Orchestra, The Kimmel Center of Performing Arts, The Curtis Institute of Music, the Philadelphia International Festival of the Arts, The Marian Anderson Awards Gala, Philadelphia Museum of Art and the Johnson House Historic Site. View and download the biography in Adobe Acrobat format.